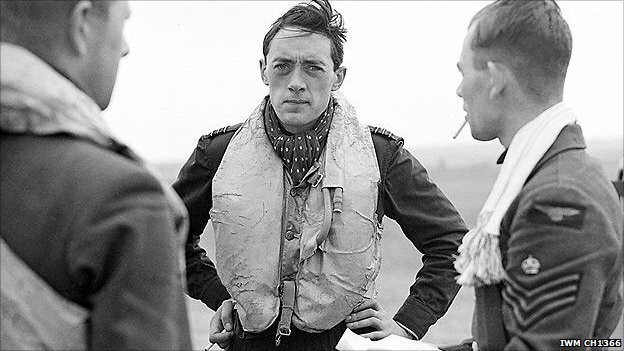 Squadron Leader B J E 'Sandy' Lane (centre), pictured here aged 23. He was killed in combat 2 years later. It was Air Chief Marshal Sir Hugh Dowding who decided the dates of the Battle of Britain, which he put forward in his official despatch. As commander of RAF Fighter Command, the front-line in Britain's aerial defence, it was his prerogative, although he freely admitted the start date of 10 July 1940 was 'somewhat arbitrary', and only chosen because it marked the first large-scale raid over England. The real casualty figures - as opposed to those put forward at the time - clearly show the ebb and flow of the aerial battle as it raged over England 70 years ago. July was a month of comparatively light action for Fighter Command, as the Luftwaffe concentrated on attacking British ports and Channel convoys. This was part of Hitler's plan to strangle Britain economically and specifically to help persuade her war leaders to sue for peace. Several Channel convoys did take quite a pasting and out in the Atlantic, Hitler's U-Boats were just beginning to sink large tonnages of Allied shipping. But with the world's largest navy by some margin and a third of the world's shipping fleet, Britain could take these opening shots on the chin without any major cause for alarm. Certain squadrons were involved in some fairly heavy actions out over the Channel, but Fighter Command lost more men and aircraft over Dunkirk in May and early June than during July. It was in August that the Germans consider the Battle of Britain to have begun and 13 August marks what Hermann Goering, Commander-in-Chief of the Luftwaffe, termed 'Adlertag' - Eagle Day - the start of the intensified air battle against Britain, and which would involve concentrating on knocking the RAF out of the sky and on the ground. Goering reckoned it would take him just four days of good weather to clear the skies over southern Britain of the RAF, but this was based on two hugely false assumptions. The first was that the RAF had far fewer aircraft than they actually did, and far weaker aircraft production than was the reality. Luftwaffe intelligence was woefully bad - it underestimated British radar defences, had no understanding that the RAF was divided into different commands - Fighter, Bomber and Coastal - and that different airfields belonged to different air commands. The second false assumption was that he would have four clear days of weather. We traditionally think of the summer of 1940 as one of endless blue skies but actually it was persistently wet as the casualty figures show. In fact, 27-30 September was the only real period when there were four consecutive fine days. Eagle Day started for the Luftwaffe in confusion. 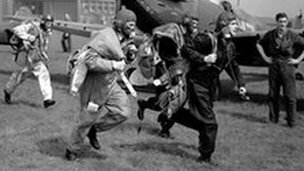 Unlike Fighter Command, it had no co-ordinated ground control and once airborne, different units could barely communicate with one another. But 15 August saw heavy fighting, while 18 August became known as the 'Hardest Day' because of the intensity of the fighting. The last week of August and the first of September are traditionally seen as the time when Fighter Command was struggling the most, but in fact, the Luftwaffe was in a far more parlous state. Certain frontline units in Fighter Command's 11 Group in south-east England were operating at about 75%, but many Luftwaffe units were down to about 20-40% strength. Despite the losses, Fighter Command's daily aircraft strength steadily rose throughout the Battle, while the Luftwaffe's plummeted. What concerned Dowding and Air Vice-Marshal Keith Park, commander of 11 Group, was the potential shortage of pilots, although it was never critical. It might have been had the Germans shot at those drifting down in parachutes, most of whom were flying again almost immediately. Bizarrely, when bearing in mind the Luftwaffe was the most Nazified of the armed services, the Luftwaffe pilots were not so ruthless as to do this, considering it not really fair play. Following RAF Bomber Command attacks on Berlin on 25/26 August, the Luftwaffe retaliated by attacking London on 7 September. Tactically, this made no sense whatsoever, because the aim was still to destroy the RAF as a prelude to an invasion. How the Luftwaffe was going to destroy the RAF by dropping bombs on London as opposed to RAF airfields is not clear, but it showed how woolly Luftwaffe thinking had become. 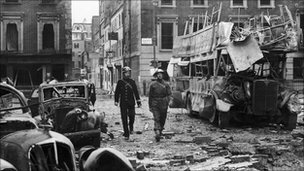 The aftermath of a German air raid, Portman Street, London, 19th September 1940. In contrast, Park was constantly refining his tactics, sending his Hurricane squadrons to attack the bombers and sending his Spitfires ever higher to pounce on the German fighters the moment they turned back towards France and by which point they were already short of fuel. These superior tactics are shown by the figures. Between 16 and 26 September, Fighter Command never lost more than five pilots in one day. Pilot losses are the crucial statistic when looking at Fighter Command losses, not aircraft. There was heavy fighting at the end of September, but by October, the intensity of the air battles was waning. Hitler indefinitely postponed his invasion plans on 12 October, and although there were still days of fierce air fighting, the Luftwaffe was as far away from destroying the RAF as ever. Instead, they continued pummelling away at London and other British cities by night - and destroying lots of buildings and civilians, but achieving little else.